Hallucinogens may be naturally occurring, like peyote, or synthetic, like MDMA. Hallucinogens are drugs that alter brain chemicals and create intense psychological effects including extreme emotional reactions, hallucinations, and other sensory and perception distortions. According to the DOJ, “Hallucinogen are found in plants and fungi or are synthetically produced,” and they are “among the oldest known group of drugs” used for the purpose of altering perception and mood. There are many different types of hallucinogens, and while some are more natural and may possibly be less harmful than others, they all have the possibility to cause dangerous side effects in those individuals who abuse them, especially frequent users. 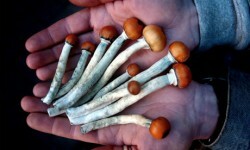 Psilocybin, or magic mushrooms, is an example of a natural hallucinogen. Background: According to CESAR, peyote is “a spineless cactus with small protrusions called ‘buttons’ that are used for psychoactive hallucinogenic purposes.” It can be grown in very few places, and its principle compound is mescaline, an amphetamine that causes hallucinogenic effects. Legal Status: The drug is a Schedule I substance, meaning it is illegal to use due to its extreme potential for abuse and inability to be used for medicinal purposes. Methods of Use: The buttons can be dried and then chewed or “soaked in water to produce an ingestible liquid,” ground into powder, smoked, ingested as a tablet, capsule, or powder, or, very rarely, injected. Legal Status: The chemical psilocybin is a Schedule I drug, but the mushrooms themselves are not scheduled. Methods of Use: Psilocybin mushrooms can be eaten fresh or dried (usually prepared with another type of food), brewed into a tea, crushed into a powder to make capsules or tablets, smoked, and rarely, injected. Background: Salvia divinorum is also known as salvia, and it is a hallucinogenic plant native to Mexico. The Mazatecs used it for many years in their religious rituals, and the plant is actually part of the sage family. Legal Status: In the United States, salvia is not listed as a controlled substance and neither is its active ingredient Salvinorin A. Methods of Use: The plant can be dried and smoked, chewed as quid, ingested, or vaporized and inhaled. Some hallucinogenic drugs can also be created in a lab instead of found in nature. Still, both types of drugs can be dangerous. Some of these substances were originally made for medicinal purposes while others were always meant to be drugs of abuse. Background: First synthesized in 1938, it was used to treat everything from schizophrenia to sexual perversions until the 1970s when it was discovered that the drug causes extreme side effects that make it unsuitable for medicinal use. Legal Status: LSD is a Schedule I drug. Methods of Use: It can be crushed into a powder and dissolved, a liquid that is dropped onto a small piece of paper that is then chewed and ingested, inhaled, or injected. Background: PCP was synthesized in 1926 as an anesthetic. Today, it is only rarely used as an animal tranquilizer because of its severe side effects. Legal Status: PCP is a Schedule I drug. Methods of Use: It can be sprinkled on cigarettes or other smokeable drugs or ingested as a pill or capsule, often unknowingly by the individual. Background: The drug is “similar to both the stimulant amphetamine and the hallucinogen mescaline” (SAMHSA). It was synthesized in 1912 and later used in “psychotherapy and marriage counseling” until it was found to be dangerous (CESAR). Legal Status: MDMA is a Schedule I drug. Methods of Use: It is taken mostly as a tablet or crushed and swallowed in a napkin and occasionally smoked.